All creatures on earth will be extinct by 2050, say the scientists. The only creatures left on earth will be humans. And we have started off to a very slow understanding on the reality of that announcement. And the only creatures left on earth will be humans. And the only humans on earth by then will be all humans as they travel through our growing polluted planet, in which they burn, a world witnessing the temperature rising up into the atmosphere. And the people of earth can now understand how awful for people to die when the heat literally burns up your lungs and spits out poison you just spit up. And there is no one who can help you. Notice: Planet earth is also loaded down with CO2 and Methane below the “former ice”, currently being opened up as oil companies are putting their rigs in the Arctic Ocean. Along with that, climate change is causing the Arctic ice to melt rapidly, and scientists predict that the Arctic will be ice free by the summer of 2016-2017 (temporarily). A number of scientists agree. There are now no significant efforts of any kind on earth to stop the climbing heat globally. Yes. There are no efforts anywhere on earth to stop the climate change, nor the large death tolls that the climbing heat will soon beginning to effect on earth’s atmosphere. Of course, these CO2 and Methane gases will cause the earth and atmosphere to become much hotter. The climate and temperatures will also become much hotter on earth, and the death toll globally will become much higher. And the temperature will continue to rise. 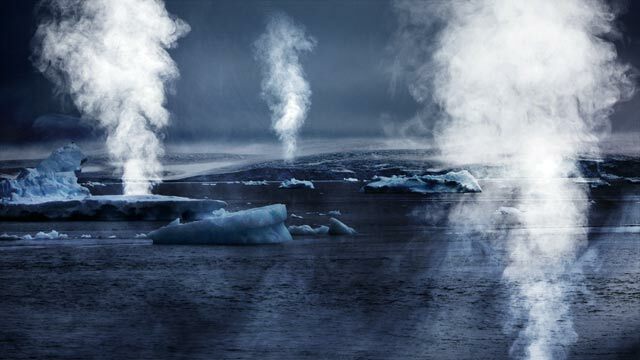 (These CO2 and Methane gases can be seen emitting into the atmosphere over the water as the ice and snow is melting.) And the scientists also notice that the ice and snow continues to see that the ocean does release massive amounts of Methane and CO2. It appears that this is now the only way to release high amounts of Methane because they have no other way. Now. It’s also easy to just watch after the ice appears and that the humans are just watching the CO2s and the Methane go straight directly to the atmosphere above. Massive amounts of these kind just allow them to be released. They can’t do anything else because they have no power of these chemicals into the atmosphere. NOTE THIS: The ice is melting quickly, and no one is now in charge. That is because they can no longer stop the release of Methane. And for your information, yes it means that we are in a possible situation. And all scientists have not found anyway to handle it if needed. And they still can’t control. And understand this fact. The scientists have nowhere to keep any methane. Since we are still having more babies, that means that by 2050, we will have (maybe) 2.4 billion more people on earth (maybe), so why are we still doing this? And the facts are that the ice and snow are still causing temperatures around the world and no one is doing anything. And we really can’t do anything. And an announcement a few weeks ago noted that they were concerned with a huge long area of Antarctica, under a mass of of ice. Under there they discovered a long huge area of Methane below that ice. This Methane could be extremely dangerous to our planet, including mass destruction to our lives and our planet. It can not be handled anywhere. All they could do is to observe everything. Too late noAnything else could make a mess. When the Methane appears, they just watch it. Bottom line. We haven’t been able to do anything when the ice and snow goes away. Now what? The scientists say, again, that they can not do anything if all of this happens. The scientist have said that. Just watch the Methane and get out of the way. It appears though that our planet could be in for perhaps a bad landing on earth. You know, this start-up happened along time again when we begin drilling the Arctic and the ice and snow began melting. It means that now large amounts of Methane and CO2 can now be noticed around the earth. It means that our time may be running out. You know, we have huge amounts of these products and a lot of these products have been opened up-and they said they were safe. That was a lie. But the CEOs and drillers don’t mine that. We are opening the vault to all Methane and CO2 to planet earth. The ice is going away and planet earth is being blasted with our death rays now. It is all they can do now. NO ONE IS IN CHARGE. Now what? For your information, the scientists and officials are now just standing by as the Methane and CO2 are now being launched into our atmosphere. AGAIN. NOTE: Scientists state that by the year of 2050 all creatures will be gone by extinction. NOTE: Humans are not part of this extinction. www.Planetextinction.com/Newsletter/is a group that has a huge goal to save the planet earth from real threats. It is a number of organizations that has no chance of saving much of anything. But it is trying t0 stop our planet from greenhouse disaster. It can at least show all of the threats that earth is under fire from, such as CO2 and much more. The Earth will be closing in on Human Extinction by 2099 When all animals on Earth have gone….? ?